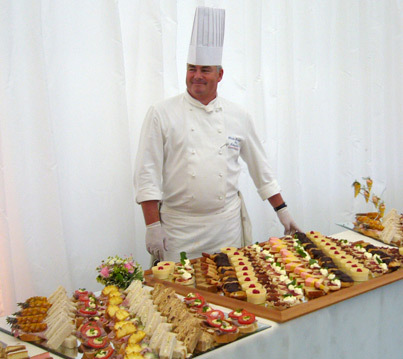 If you organising a corporate event or product launch you will want the 'wow' factor. I have the vision and skills to provide you an eye-catching catering event that can represent you company with bespoke designed food and sculpture. Shapes and colours combined with flavour and texture will give your guests a memorable time. No beige flat food with this chef. I would do a site visit to talk through the event to understand your aspirations and then help you to translate them into the perfect event. I have a network of professionals who can supply cocktails, photography music and theme your venue. I have years of television experience and am able to film videos for your catering equipment or food product. Alternatively a lively cookery demo to engage your audience can help sell a product. What a great conference! Just wanted to express my gratitude for an excellent spread, once again the catering was absolutely faultless. Hi Simon, Alison & Hannah Thank you all so much for your top quality service both at our HQ and the Birmingham gallery yesterday. This was such an important event for DeMontfort and therefore essential that our clients and Artists were impressed!